Over the last few posts I've described a lot of the more stressful aspects of Level 3; however, there was a lot that was really fun about it as well. For example, because we were usually done cooking the timed dishes well before the end of the day, Chef would come up with fun extra food projects for us to make. 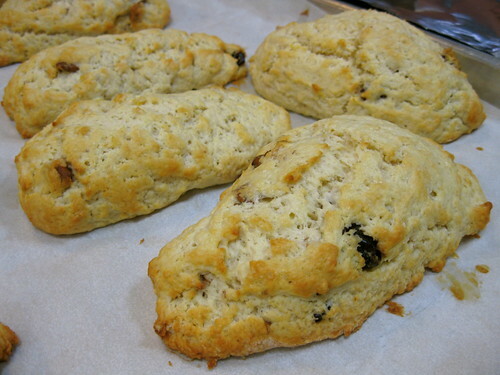 We had afternoons dedicated to making scones, pastas, and pizzas. There were many yummy goodies to bring home. 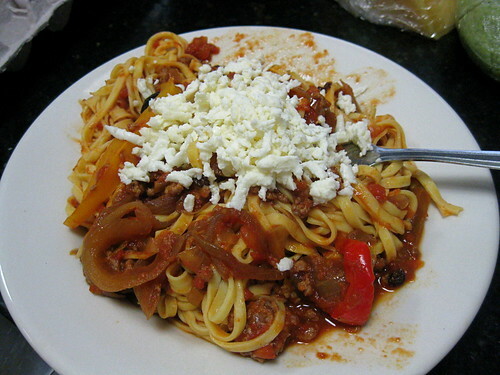 This heaping plate of pasta was made by one of my classmates, but I was seduced by the sheer abundance of the bowl and had to take a picture. My favorite part of the level though, hands down, was creating amuse bouches. In between making our assigned dishes, many days we also had to make an amuse bouche or canapé with our teams from a group of mystery ingredients revealed to us each morning. It was a lot like Chopped. Some days the canapé exercise seemed like an unwelcome added stressor, but most of the time it was an incredibly fun creative outlet. It turns out that I'm not only good at eating canapés; I'm also pretty good at making them. All of the canapés that I conceived or had a major hand in got really good reviews from Chef. A couple of my girlfriends/classmates dubbed went so far as to dub me Queen of Canapé. Open Faced Pulled Duck Sandwich Bite. The garnish is made up of strips of jalapeños, carrot, green apple and jicama. Veal - Squash roll with Grilled Peaches and Peach-Scallion Glaze. I reduced the jus from the veal and infused it with scallion, a little bit of brandy en flambé, plus a little of this and that. I added that to a peach compote that I had also reduced down, then strained it all, and reduced again to form the smooth glaze. 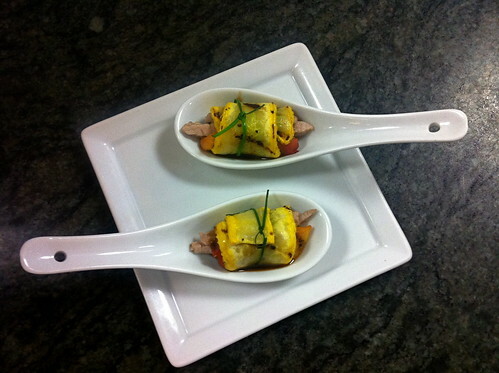 I made these during our first week of making the amuse bouche. My teammates that week were good sounding boards and helped out in the preparation a lot, but for the most part gave me creative control in conceiving the plate. The way this process actually worked was very much by the mad scientist or idiot savant methods. Flavor combinations would come to me quickly, but the plating concept would come later. So basically, I'd start to cook while having only the vaguest of ideas of what I was actually doing. Some days were pretty touch and go, but it all worked out in the end. My friend Leticia was in my second team and the two of us together made a canapé partnership made in heaven. She was strong where I weakest. She could easily envision plating concepts, while the flavor palates took shape in my head. We had a lot of fun coming up with our joint dishes. Smoked Mousse Choux. It was kind of a fancy take on bagels and lox. Smoked Salmon and goat cheese were mixed together, along a little cream, chives, and shallots that had been sweated down in white wine. We blended it all in the robot-coupe to create the mousse texture. 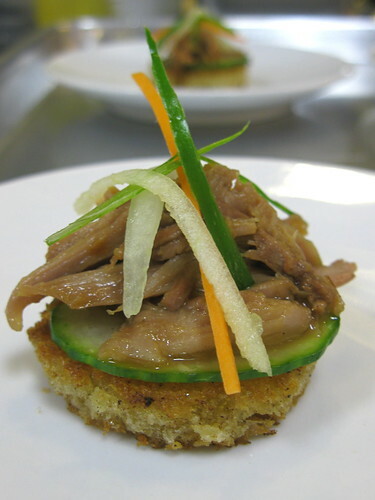 Shreded Duck "Sushi." 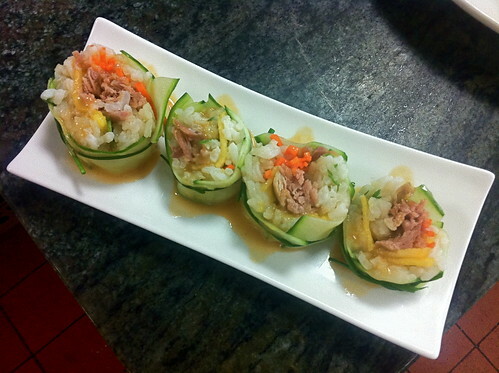 Shredded duck, carrots, and peach slices were rolled with rice in cucumber sheets to mock the nori in a sushi roll. The shredded duck was coated in a peach sauce, combined with the jus from the duck, sesame oil, white wine vinegar, fire roasted jalapeños, and soy sauce. 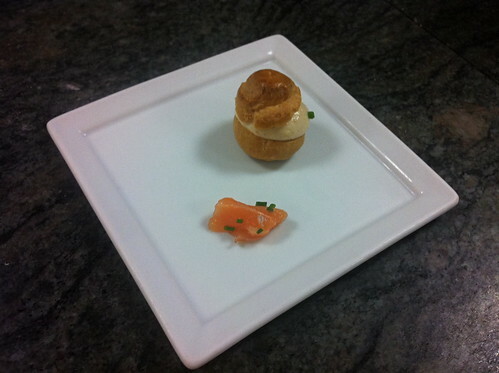 This is the last canapé I had a real hand in during the level. It was group effort amongst five teammates. As often happens with group efforts amongst opinionated people, there was some head butting and a little bit of drama. You wouldn’t have been able to tell from the final product though. It was delish! Steak Frite Bite. 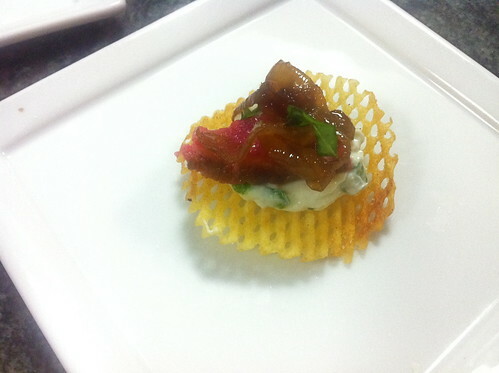 A slice of rare steak was layered on herbed goat cheese on a potato gaufrette, topped off with caramelized onions. I’ve showcased my own work here, however, seeing all of the canapés the other groups would come up with was always really inspiring. It was very cool to see all the beautiful, creative things my classmates came up with. I can’t wait to see what else these folks create down the line. It takes months even years of practice to perfect plating, since it requires not only an eye for details but also exemplary knifing skills and a delicate touch.